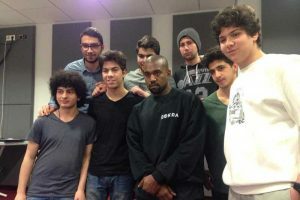 Kanye West was seen today hanging out at Tumo School where students shared their musical skills with him. In a video Shared by one of the present students, Kanye seems to be enjoying the Armenian Stars. Students expressed their gratitude of the interest of the American Star in local talents, while the Rapper was seriously concentrated and probably being inspired for his next Album. Tumo’s leadership team is made up of highly successful industy professionals across the entire spectrum of the center’s focus areas.